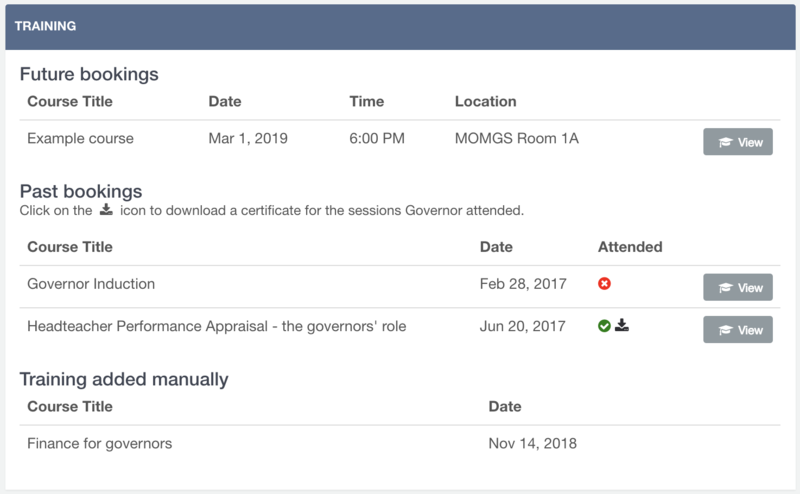 How to see training sessions, download training reports, and see training bookings and records for your governors. To see all past and future training sessions on the Admin site, go to Training > All sessions. For future sessions, the Spaces filled bar shows how many delegates are booked onto the course, and will change colour from green to orange, then to red as more spaces are filled. For past sessions, the Attendance bar shows how many of the people that booked attended (green), how many didn't attend (orange), and how many spaces weren't filled. To download reports for training records, training bookings, and training attended, go to Training > Training reports. You can then use the report builder to download training records, bookings or attendance for all time or between specific dates. You can also use the User reports section to search for governors and see their training records, past bookings, and future bookings.